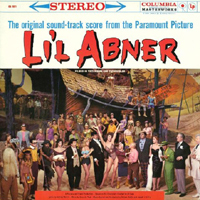 Film Soundtrack, 1959 (Columbia/Sony) (2 / 5) Paramount’s film version of Li’l Abner was among the most faithful of its era, retaining a lot of the Broadway score and several of the leading players, as well as a stage-bound production design. So there are few surprises on this soundtrack album. Among the pluses: Peter Palmer has loosened up a lot, Nelson Riddle’s new arrangements are fresh and snazzy, and this recording is in end-to-end stereo. 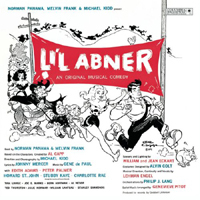 But there are minuses: Several stage songs are missing; the one new ballad, “Otherwise,” doesn’t equal the one it replaced, “Love in a Home”; some of Mercer’s lyrics were dumbed down for the movie; and Imogene Lynn, the voice double for Leslie Parrish’s Daisy Mae, hasn’t as much style as her stage counterpart, Edith (Edie) Adams. Still, the album is a pleasant souvenir of one of the better ’50s stage-to-screen transcriptions. — M.M.